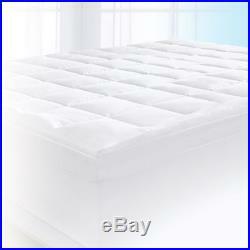 Serta 4 Pillow-Top and Memory Foam Mattress Topper. 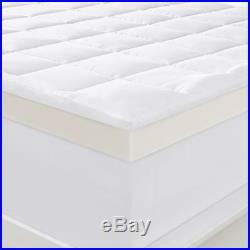 Non-slip cover secures topper to mattress and protects it. Extends the life of your mattress. Offers the cradling comfort of memory foam along with a pillow top. The Serta 4 Pillow-Top and Memory Foam Mattress Topper turns your mattress into a luxurious sleeping surface with a soft pillow-top and cradling memory foam. The 3-inch layer of memory foam gently supports you while alleviating painful pressure points that can cause tossing and turning. The memory foam layer is topped with one inch of plush pillow-top adding comfort. The included quilted cover secures and protects the topper, is removable, machine washable and stretches to fit up to a 17-inch mattress. This Serta mattress topper is the perfect way to upgrade a new mattress or extend the life of an old one. 4-inch construction: 3 inches of memory foam + 1 inch of soft fiber pillow-top. Washable quilted cover included, which stretches to fit up to a 17-inch mattress. Foam made in the USA. Please inspect your order carefully upon receipt. We cannot honor any damage claims after the 5 day period. Please notify us within 30 days after receipt. You will be responsible for arranging. Packaging material or something equivalent. Thanks for shopping with us! The item "Serta 4 Pillow-Top and Memory Foam Mattress Topper QUEEN" is in sale since Wednesday, November 01, 2017. This item is in the category "Home & Garden\Bedding\Other Bedding". The seller is "toroshomegoods" and is located in Dallas, Texas. This item can be shipped to United States, Canada, United Kingdom, Denmark, Romania, Slovakia, Bulgaria, Czech republic, Finland, Hungary, Latvia, Lithuania, Malta, Estonia, Australia, Greece, Portugal, Cyprus, Slovenia, Japan, China, Sweden, South Korea, Indonesia, Taiwan, Thailand, Belgium, France, Hong Kong, Ireland, Netherlands, Poland, Spain, Italy, Germany, Austria, Russian federation, Israel, Mexico, New Zealand, Philippines, Singapore, Switzerland, Norway, Saudi arabia, Ukraine, United arab emirates, Qatar, Kuwait, Bahrain, Croatia, Malaysia, Brazil, Chile, Colombia, Costa rica, Dominican republic, Panama, Trinidad and tobago, Guatemala, El salvador, Honduras, Jamaica, Antigua and barbuda, Aruba, Belize, Dominica, Grenada, Saint kitts and nevis, Saint lucia, Montserrat, Turks and caicos islands, Barbados, Bangladesh, Bermuda, Brunei darussalam, Bolivia, Ecuador, Egypt, French guiana, Guernsey, Gibraltar, Guadeloupe, Iceland, Jersey, Jordan, Cambodia, Cayman islands, Liechtenstein, Sri lanka, Luxembourg, Monaco, Macao, Martinique, Maldives, Nicaragua, Oman, Pakistan, Paraguay, Reunion.